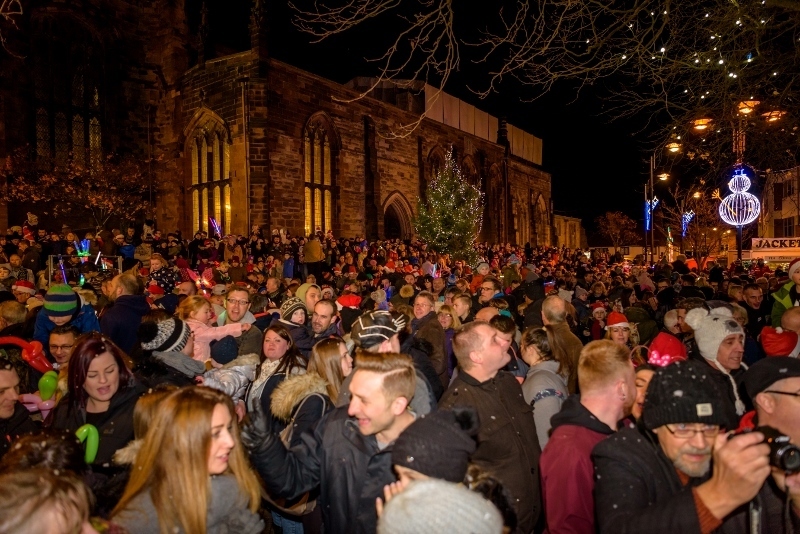 Festive cheer came to the Staffordshire town of Tamworth as thousands of people ventured out to enjoy the Christmas lights switch-on. 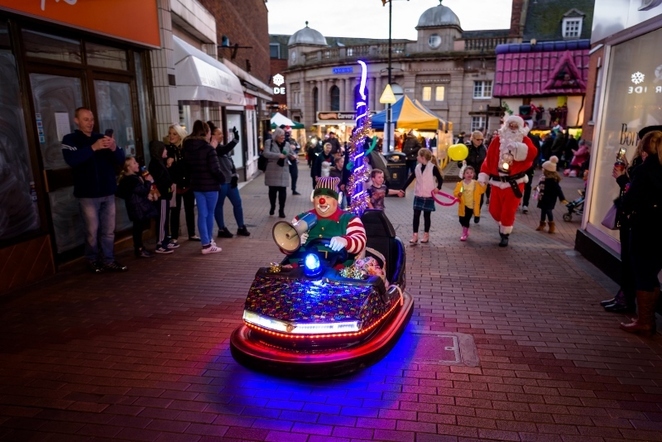 An estimated 8,000 people flocked to the town centre of Tamworth for an afternoon of free festive fun which culminated in the switching on of the lights at 5pm. 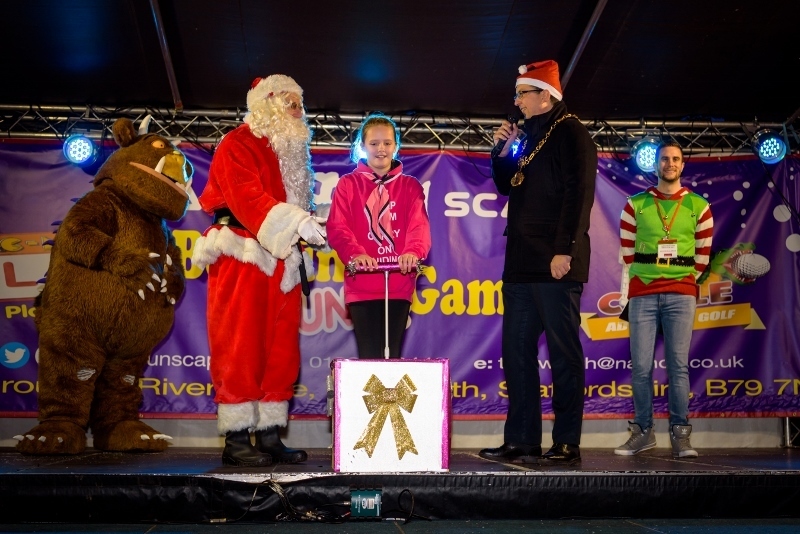 The honour of switching on the Christmas lights went to Amanda Little, the winner of a special Bake-Off style competition, accompanied by the Mayor of Tamworth, Councillor John Chesworth, and not forgetting Father Christmas and The Gruffalo who also made a special appearance. The seasonal festivities began in style with a Christmas market, fairground rides, a nativity, walkabout characters, craft activities, face painting, a lantern parade, and a variety of live performances from the Touch FM stage in St Editha's Square next to St Editha's Church. The annual Christmas lights switch-on, which is organised with the Tamworth Christmas Lights Festival Committee, is another favourite in the Tamworth Arts & Events calendar which attracts thousands of people each year. The switch-on also coincided with the annual Christmas Tree Festival in St Editha's Church, which gave visitors the chance to admire dozens of trees decorated by schools, businesses, local groups and individuals. The focal point for the afternoon of fun was the Touch FM stage in St Editha's Square, featuring live performances from St Leonard's Primary School, Matilda Pratt, Ellie Lake, Upbeat Dance Company, Stage It!, Just Perform and Tamworth Voices, who ended the proceedings with a Christmas sing-along. The festive market also proved a huge success with dozens of stalls lining George Street, offering a range of Christmas delights from seasonal local produce to gifts, novelties and crafts. Shoppers were greeted by the sounds of Tamworth Wind Band and Positive Labels, a group of young local musicians, while elsewhere, under the Town Hall, Landau Sixth Form Academy performed with a 'Site Specific Dance'. This was followed by members of St Francis Church who staged a nativity and Tamworth Pantomime Company performing a teaser of this year's panto, Cinderella. Children got involved with craft activities and lantern making at the Castle Activity Centre in Tamworth Castle Grounds. Free glow-sticks were given to the children prior to the parade to ensure their lanterns glowed. The Mayor of Tamworth, Councillor John Chesworth, said: "The Christmas lights switch-on is yet another popular event in Tamworth's busy programme of free entertainment with a wide range of activities taking place throughout the town centre. Once again the committee of organisers did us proud with another fantastic and enjoyable afternoon of fun which really got everyone in the festive mood. There was something for everyone to enjoy and it was great to see families and people of all ages enjoying themselves."